Another chocolate on steroids recipe that you will LOVE! Cocoa nibs (bits of roasted shelled cocoa beans) are available at specialty foods stores or chefshop.com. 1. Preheat oven to 350°F. Butter 9-inch-diameter glass pie dish. 2.Mix melted butter, sugar, and salt in medium bowl. Add flour and mix until well blended. Press dough onto bottom and up sides of prepared dish; crimp edges decoratively. Bake crust until golden brown and cooked through, about 18 minutes. Cool crust completely on rack. Maintain oven temperature. 1. Line rimmed baking sheet with parchment paper. Whisk first 5 ingredients in medium bowl to blend. Stir in cocoa nibs and chopped pecans. Drop mixture by tablespoonfuls onto prepared sheet, spacing 1 inch apart. Bake until mixture spreads and is deep golden brown, about 18 minutes (mixture will flow together into 1 piece on baking sheet). Remove from oven; cool completely on sheet. 1. Bring 2 cups milk to simmer in heavy medium saucepan; remove from heat. Whisk egg yolks, brown sugar, vanilla, and remaining 1/4 cup milk to blend in medium bowl; whisk in cocoa powder and cornstarch until smooth. Gradually whisk in hot milk mixture. Return mixture to saucepan. Whisk constantly over medium heat until mixture thickens and boils. 3. Using electric mixer, beat cream and powdered sugar until soft peaks form. 4. Cut pie into wedges. 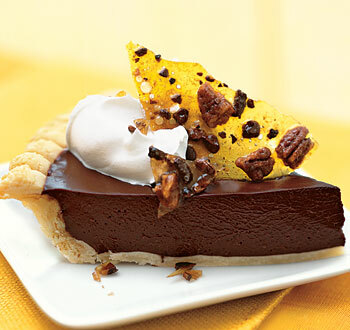 Serve with whipped cream and praline pieces. Given this is a tasty low-cal treat, I’m in.